The State of Kuwait (Arabic: الكويت ‎) is a small constitutional monarchy on the coast of the Persian Gulf, enclosed by Saudi Arabia to the south and Iraq to the north. The name is a diminutive of an Arabic word meaning "fortress built near water." Kuwait was established in the sixteenth century when several clans met in the area now known as "the Kuwait Bay". Bedouins from the "Al Azimi" tribe were in this area before others have joined. Some groups from the "Al Aniza" tribe migrated to Kuwait from Najd in centre of the Arabian Peninsula. On the other hand, other people such as, Iraqi Assyrians, migrated to the same area; while, Iranian people migrated from Iran, crossing the Persian gulf. A well-built hut was discovered near the shores, they call it a “Kut”. From this name, "Kuwait" was derived. The current rulers of the country are descended from Sabah I, who was chosen by the community, which was composed mainly of traders. The duties of the rulers include administering the affairs of the State, including foreign affairs and taxation/duties. This is unlike most other Arab emirates of the Persian Gulf, where the rulers seized and maintained their authority by force. The seventeenth century saw the Arabian Peninsula experience some tumultuous times. The area that is now Kuwait was occupied by tribes and used for spice trading from India. By the eighteenth century, most of the local people made a living selling pearls. But as pearl farming developed in Japan during the 1930s, Kuwait became impoverished. In 1899, growing British influence led to Kuwait becoming a British protectorate. Oil later transformed Kuwait into one of the richest countries in the Arab peninsula and in 1953 the country became the largest exporter of oil in the Persian Gulf. This massive growth attracted many immigrant labourers who were rarely granted citizenship. Having amassed great wealth, Kuwait was the first of the Persian Gulf Arab states to declare independence, on June 19, 1961. This declaration was challenged by Iraq which claimed that Kuwait was an integral part of Iraqi territory. It threatened to invade Kuwait but was deterred by the British, who flew in troops. An important period in Kuwait's political, social and economic development was the Souk Al-Manakh stock market crash of 1982. This was a major crash that had widespread consequences and has endured in the public memory even decades later. 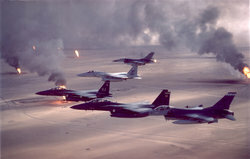 USAF aircraft ( F-16, F-15C and F-15E) fly over Kuwaiti oil fires, set by the retreating Iraqi army during Operation Desert Storm in 1991. After being allied with Iraq during the Iran-Iraq War until its end in 1988 (Kuwait paid Iraq to protect it from what it perceived as a threat posed by Iran), Kuwait was invaded and annexed by Iraq (under Saddam Hussein) on August 2, 1990. Hussein's primary justifications included a charge that Kuwaiti territory was in fact an Iraqi province, and that annexation was retaliation for the "economic warfare" that Kuwait allegedly had waged through slant drilling into oil supplies on Iraqi territories. Hussein deposed the monarchy after the annexation and installed a new Kuwaiti governor. Authorized by the UN Security Council, an American-led coalition of thirty-four nations fought the Persian Gulf War to liberate Kuwait. After six weeks of fierce fighting in early 1991, the coalition forced Iraq to withdraw its troops from Kuwait on February 26, 1991. During their retreat, the Iraqi armed forces exacted a scorched earth policy by setting fire to Kuwaiti oil wells. The fires took more than nine months to extinguish fully and the cost of repairs to the oil infrastructure exceeded $5 billion. Certain buildings and infrastructural facilities (including Kuwait International Airport) were also severely damaged during the war. Kuwait remains under the governance of the Emir, Sabah Al-Ahmad Al-Jabir Al-Sabah (since 29 January 2006) as an independent state and is of strategic importance to the United States. Kuwait is a constitutional monarchy and has the oldest directly elected parliament of the Persian Gulf Arab countries. Chief of state is the Emir (Amir), a hereditary title. The Emir appoints the prime minister, who until recently was also the crown prince. A council of ministers aids the prime minister in his task as head of government which must contain at least one of elected members of the parliament. The number of ministers must not exceed ⅓ of the elected members of the parliament. The parliament has the power to dismiss the prime minister or anyone of his cabinet through a series of constitutional procedures. According to the constitution, nomination of a new crown prince by the ruling family has to be confirmed by the National Assembly. If he does not win the votes of an absolute majority of the assembly, the Emir must submit the names of three candidates to the National Assembly, and the Assembly must select one of these to be the new crown prince. The parliament known as the Majlis Al-Umma (National Assembly), consists of elected fifty members, who are chosen in elections held every four years. Government ministers, according to the Constitution of the State, are given automatic membership in the parliament, and can number up to fifteen. Prior to 2005, only 15% of the Kuwaiti citizen population was allowed to vote, with all women, "recently naturalized" citizens (i.e. those of less than thirty years' citizenship), and members of the armed forces excluded. On May 16, 2005, Parliament permitted women's suffrage by a 35-23 vote, subject to Islamic law and effective for the 2006 Parliamentary Election. The decision could raise Kuwait's voter rolls from 139,000 to as many as 339,000 if all eligible women register; the total number of Kuwaitis is estimated at more than 960,000. Recently, the former Prime Minister Sheikh Sabah al-Ahmad al-Sabah announced the appointment of Dr Massouma Mubarak as planning minister and minister of state for administrative development affairs. The appointment of a woman as a cabinet minister was a major breakthrough in Kuwaiti political system and it makes Kuwait the third country in the conservative Persian Gulf Arab monarchies to have a woman cabinet minister. South-eastern Kuwait from space. 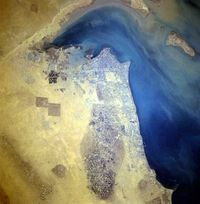 The majority of Kuwait's population lives in coastal areas. Kuwait enjoys a variable continental climate. Summers (April to October) are extremely hot and dry with temperatures exceeding 51°C (124°F) in Kuwait City. Winters (November to February) are cool with limited precipitation and the temperature level dropping below 21°C (70°F). The spring season is cool and pleasant. 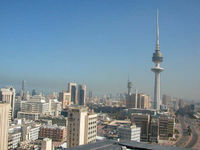 The major cities are the capital Kuwait City and Jahrah (a thirty-minute drive northwest of Kuwait City). The main residential and business areas are Salmiya and Hawalli. The main industrial area is Shuwaikh within the Al Asimah Governorate. Kuwait for the size of the country is a very rich and a relatively open economy with proven crude oil reserves of 96 billion barrels (15 km³), estimated to be 10% of the world's reserves. Petroleum accounts for nearly half of GDP, 95% of export revenues, and 80% of government income. Kuwait's climate limits agricultural development. Consequently, with the exception of fish, it depends almost wholly on food imports. About 75% of potable water must be distilled or imported. Higher oil prices put the FY99/00 budget into a €1.7 billion ($2 billion) surplus. The FY00/01 budget covers only nine months because of a change in the fiscal year. The budget for FY01/02 envisioned higher expenditures for salaries, construction, and other general categories. Kuwait continues its discussions with foreign oil companies to develop fields in the northern part of the country. By 1990, the country earned more from foreign investment than from oil exports. The expenses of the Iraqi invasion and postwar reconstruction placed a heavy economic burden on the country, but by the mid-1990s Kuwait had resumed its pre-invasion prosperity. Gross domestic product (GDP) for 2005 was $53.31 billion, giving Kuwait a per-capita GDP of $22,800. The labour force totals 1,670,000 people, only about one-fifth of whom are Kuwaiti citizens. The Central Bank of Kuwait in the capital city issues Kuwait’s currency, the Kuwaiti dinar. The dinar is currently valued at 0.351676 KWD per 1EUR and at 0.292010 KWD per 1USD, making it the highest-valued currency in the world. Since the government owns the oil industry, it controls most of the country's economy; in all, about 75 percent of the GDP. Kuwait’s oil exports vary depending on internal needs – almost all of Kuwait’s energy is derived from oil – and on international demand and prices and production quotas fixed by the Organization of Petroleum Exporting Countries (OPEC), of which Kuwait is a member. OPEC’s quotas, however, are difficult to enforce, and Kuwait and other countries have been accused of violating them. In 2002 oil production was 692 million barrels. International marketing and mother company. Crude oil exploration and development company. Runs oil refineries across Kuwait. Runs refining and marketing business overseas. A petrochemical company formed by PIC and Dow Chemical. Responsible for all training and career development within the KPC companies. Oil and gas exploration and production in the divided zone; joint venture with Saudi Arabia. Handles all construction projects, maintenance, security, fire-fighting, and medical services to all oil sector employees and their families. As of the end of 2005, Kuwait had a total population of 2.992 million people which included approximately 2 million non-nationals. Kuwaiti citizens are therefore a minority of those who reside in Kuwait. The government only rarely grants citizenship to non-citizens (who are generally referred to as expatriates). About 57% of the Kuwaiti population is Arab; Arab expatriates include a large group of stateless Arabs, locally known as Bidoon (an Arabic word meaning "without" and distinct from " Bedouin"), along with Egyptians, Lebanese and other Arabs. Other large groups of expatriates include Pakistanis, Indians, Bangladeshis and Filipinos. In 2003, more than 400,000 Indian nationals lived in Kuwait, making them the largest expatriate community there. Kuwait formerly had a large Palestinian population, though most of them were forced out of the country after PLO leader Yassir Arafat's support for Iraq during the Iraqi occupation of Kuwait. The official language is Arabic, although English is generally understood. Hindi, Urdu, Punjabi Bengali, Malayalam and other Indian languages are largely spoken by expatriates from the Indian subcontinent. About 85% of Kuwait's population are Muslims (70% Sunni and 30% Shia). The remaining population is primarily comprised of Christians and Hindus. The skyline of Kuwait City. At 372 m (1,220 ft), the Liberation Tower (seen in background) is the world's thirteenth-tallest free-standing structure. Kuwait's infrastructure was severely damaged during the First Persian Gulf War. Hundreds of oil wells were set on fire and the country's oil production had come to standstill. Much has changed since the end of the Persian Gulf War. The Kuwaiti government has spent billions of dollars to construct an elaborate roadway system and in 2003, the telecommunication industry achieved an incredible growth rate. Kuwait City boasts more than a dozen five-star hotels and resorts and several skyscrapers dominate the city's skyline. Kuwait Infrastructure Maintenance Management System overlooks the oil-rich country's infrastructure. Kuwait's energy sector is the main source for 47% of the country's annual income. Kuwait has also planned one of the biggest sea front projects in the world, Madinat al-Hareer. If completed, this project would include the world's tallest tower, and numerous housing, health, education, environmental, business, and tourism centres. Kuwait’s transportation system is modern and efficient, with a road system that is well developed by regional standards. Roads total 4,450 kilometers (2,765 mi), of which 81% are paved and 350 kilometers (217 mi) are freeways. The network includes over 250 bridges, although many of these are of surprisingly poor quality. Most people travel by automobile. There is no railway system in Kuwait although public and private bus systems are operated. An international airport is located in the southern outskirts of the Kuwait city metropolitan area and Kuwait Airways is the national airline owned by the government. There is a new airline company called Jazeera Airways. The country has three modern seaports, one of which specializes in oil exports. Oil revenues have allowed Kuwait to build an extensive educational system, yielding a literacy rate of 90 percent. Public school is free and compulsory from the age of 6 to 13, and several private schools also teach this age group. The first private co-educational school to open was the New English School in Jabriya, opened by Mr. Tareq S Rajab in 1969. It was the first day-school to offer a British style curriculum. Kuwait University is Kuwait's only public university, but has a prestigious reputation in the Middle East. Both the extensive library system at Kuwait University and the collection at Kuwait National Museum (1957) were heavily damaged and looted during the Iraqi occupation in the 1991 Persian Gulf War. The Gulf University for Science and Technology is the first private university established in Kuwait. Other private universities are the American University of Kuwait and the Australian College of Kuwait.